We are nuts for cherries — with this recipe you can use fresh cherries or the frozen kind. Keep a pack in the freezer and you can whip up these pancakes anytime! 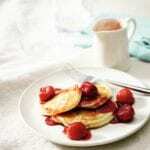 Ricotta adds a richness and moisture to the batter to make these pancakes a cut above. Any leftover cherries can be chilled and served the next morning with yogurt and granola. Look out for the stones in the cherries. Place the cherries, orange and lemon juice, honey and vanilla in a small saucepan. Bring to the boil and simmer gently for 15 minutes until the cherries are tender and the liquid is syrupy. Meanwhile, place the ricotta, lemon zest, milk and egg yolks in a bowl and beat to combine. Add the flour, baking powder and a pinch of salt, and fold in to make a smooth batter. In another bowl, beat the egg whites until they’re softly peaking, then fold into the mixture. Brush a heavy-based frying pan with a little oil and drop large spoonful’s of batter into the pan to make 6-7cm-sized pancakes. Cook for 1-2 minutes each side until golden and cooked through. Cover and keep warm while you cook in batches to make 12. 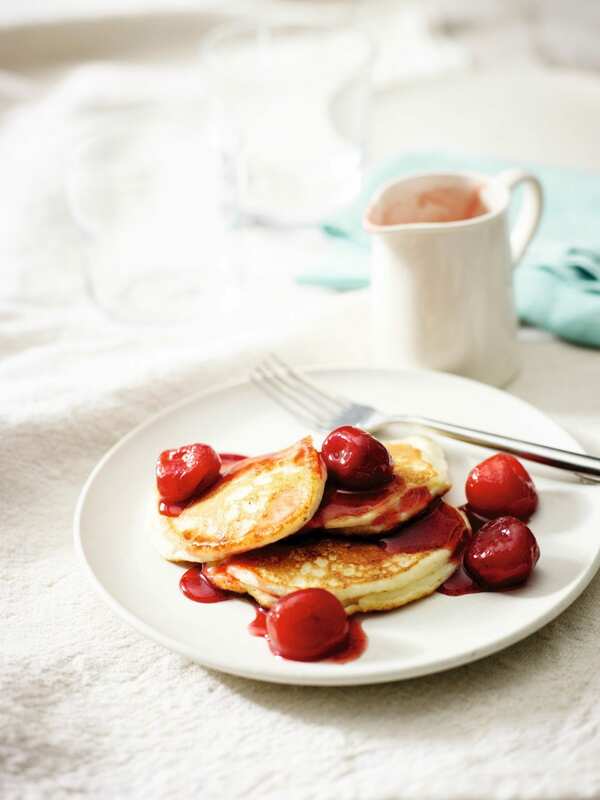 Divide the pancakes between 4 plates, spoon over the poached cherries and serve.